The UK needs an Earth Observation Day! Not sure if you know, but today – April 9th – is Earth Observation Day in America! Any celebration of Earth Observation has our support, but this particular initiative deserves promotion as it’s focussed on inspiring students, and teachers, to engage with remote sensing applications; something that’s at the heart of our company too. The event is the brainchild of a non-profit organisation called AmericaView; whose aim is to advance the availability, timely distribution, and widespread use of remote sensing data and technology through education, research and outreach, and sustainable technology transfer to the public and private sectors. The day itself focuses on using remote sensing imagery and in-situ measurements to explore surface temperature for different types of land cover using Landsat imagery; as it’s freely available and has a historical archive. The AmericaView website has exercises and factsheets to support activities for kindergarten to year 12. In addition, AmericaView scientists, who have expertise in remote sensing and geospatial technology, support teachers in their local area by giving talks, helping teachers design lessons or being available to answer student’s questions. We think this is a brilliant way to get students learning about remote sensing, and using lots of elements of the science, technology, engineering and mathematics (STEM) curriculums. We wondered why we don’t have something similar in the UK? We know there are similar events, for example the Royal Geography Society has been running a GIS (Geographical Information Systems) Day for a number of years; and the National STEM Centre supported World Meteorological Day on the 23 March that looked at weather and climate change. However, there is far more to remote sensing and Earth Observation than weather. We need to promote the potential for the subject to support crop management, helping disaster response, forestry use, support water and marine management, urban planning, flood prevention … the list could go on! Earth Observation offers huge potential to help our understanding of this planet and its natural resources. With the introduction of cubesats, swarm satellites, and last week’s successful launch of the first satellite of ESA’s Copernicus mission, data available is going to increase exponentially in the near future. It gives students opportunities enhance learning, and apply skills, in a variety of subjects beyond the obvious STEM ones. Remote sensing could be used in the teaching of geography, history and even politics. Couple this with the ambition to double the size of the UK space sector by 2020, Earth Observation could not only supports learning, but offers realistic opportunities for future jobs and careers. We need to interest, excite and, most importantly, inspire the next generation of scientists in this country, and an educational based Earth Observation Day could play an exciting part of that development. What does the rest of the Earth Observation community think? 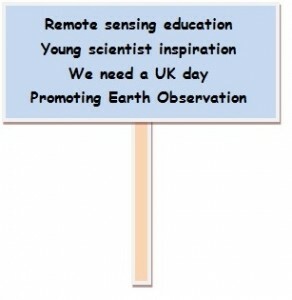 Should we get our voice heard for an Earth Observation day here too? This entry was posted in Copernicus, Earth Observation, Education, Landsat, Space Industry, Understanding Space and tagged AmericaView, Earth Observation Day, inspiration, Landsat, learning, pixalytics, remote sensing, STEM, UK by Andy. Bookmark the permalink.